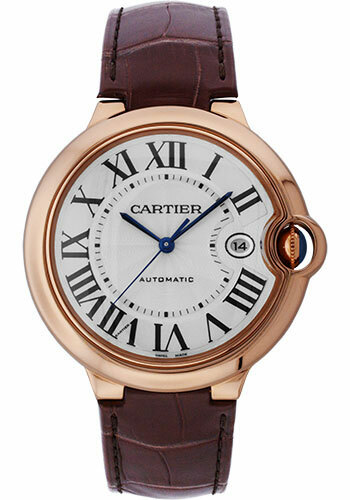 Large size (42.1mm) 18K rose gold case, guilloché and lacquered dial with Roman numerals and date at 3 o'clock, automatic winding Cartier calibre 049 movement, alligator strap with 18K gold deployant buckle. Water resistant to 30 meters. Large size (42.1mm) 18K pink gold case, fluted crown with a blue sapphire cabochon, chocolate-brown guilloché dial, automatic winding Cartier caliber 049 movement, 18K pink gold bracelet. Water resistant to 30 meters. Large size (42.1mm) 18K pink gold case, fluted crown with a blue sapphire cabochon, chocolate-brown guilloché dial with pink gold Roman numerals, automatic winding Cartier caliber 049 movement with date at 3 o'clock, alligator strap with 18K pink gold double adjustable deployant buckle. Water resistant to 30 meters. Large size (42.1mm) 18K pink gold case, diamond bezel, guilloché and lacquered dial with Roman numerals and date at 3 o'clock, automatic winding Cartier calibre 049 movement, 18K pink gold bracelet. Water resistant to 30 meters. 42.1mm 18K pink gold case, 13mm thick, fluted crown with a blue cabochon-shaped sapphire, sapphire crystal, silvered dial with Roman numerals and blued-steel sword-shaped hands, automatic movement, 18K pink gold bracelet. Water resistant to 30 meters. 42.1mm 18K pink gold case, 13mm thick, fluted crown with a blue cabochon-shaped sapphire, sapphire crystal, silvered dial with Roman numerals and blued-steel sword-shaped hands, automatic movement, brown alligator skin strap, 18K pink gold double adjustable folding buckle. Water resistant to 30 meters. 42mm 18K pink gold case with 126 brilliant-cut diamonds totaling 1.83 carats, 13mm thick, fluted crown with a sapphire cabochon, sapphire crystal, white dial with silvered guilloche lacquered opaline and blued-steel sword-shaped hands, automatic movement, 18K pink gold bracelet with wrist size 185mm. Water resistant to 30 meters. 42mm 18K yellow gold case with 126 brilliant-cut diamonds totaling 1.83 carats, 13mm thick, fluted crown with a sapphire cabochon, sapphire crystal, white dial with silvered guilloche lacquered opaline and blued-steel sword-shaped hands, automatic movement, purple alligator skin strap. Water resistant to 30 meters. 42mm 18K pink gold case, 13mm thick, fluted crown set with a sapphire cabochon, bezel set with brilliant-cut diamonds, sapphire crystal, silvered sunray-brushed dial with blued-steel sword-shaped hands, automatic movement, burgundy alligator strap, 18K pink gold ardillon buckle. Water resistant to 30 meteres. 42mm 18K pink gold case, 13mm thick, fluted crown set with a sapphire cabochon, bezel set with brilliant-cut diamonds, sapphire crystal, silvered sunray-brushed dial with blued-steel sword-shaped hands, automatic movement, 18K pink gold bracelet. Water resistant to 30 meteres.